Voog has all the necessary tools to manage the content of your websites, customize their designs and run them smoothly 24/7. Here's a quick overview of what Voog is great for. 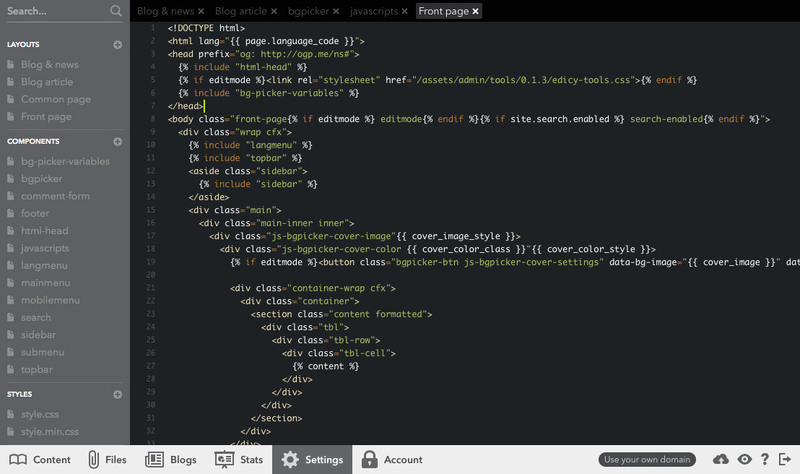 Voog is like a modern word processor sitting inside your website. The main workflow is writing text — or rather, copying it from some of your documents — and formatting it with styles, links and colors. Texts can be spiced up with rich media like photos, videos, tables — or widgets from other web apps. You can also build forms to gather feedback or receive orders from customers. The more powerful sites on Voog take advantage of our database tools to build product catalogues. Take photos straight from your camera and just drag them into your site. Voog takes care of the formatting and optimizes them for viewing both on web and mobile screens. Photos can be inserted into texts, aligned and rescaled. 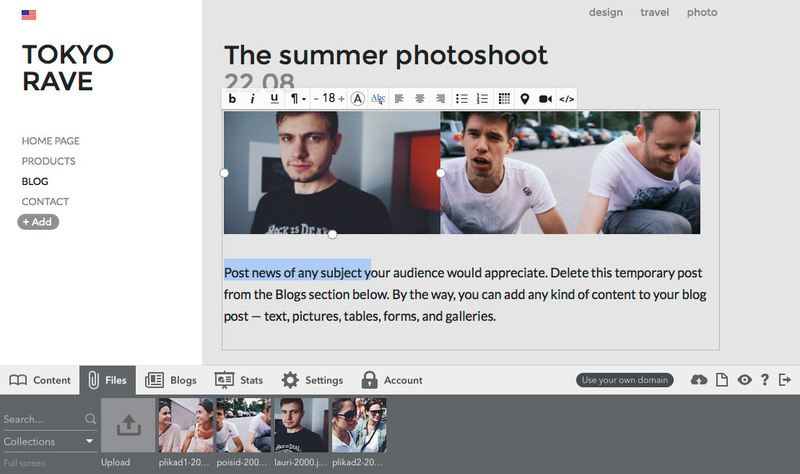 You can add titles to photos, attach links to them or combine images into galleries altogether. On many of the standard Voog designs photos can be also set as large background images. Similarily to photos, you can upload any other file to Voog and publish it on your website — be it document (PDF, Word, etc) or any other file format. Most popular websites on Voog have unique designs, crafted from scratch by some web agency. You can have any kind of design on your site too — Voog uses a simple and open design templating language that is understandable to any web professional. There are 24 official languages in Europe — and many more with the number of speakers reaching millions. Almost any business here needs to address its customers in more than one tongue. Voog is built from ground up to support easy maintenance multilingual websites. You can build a website in any language and just add another language version anytime. 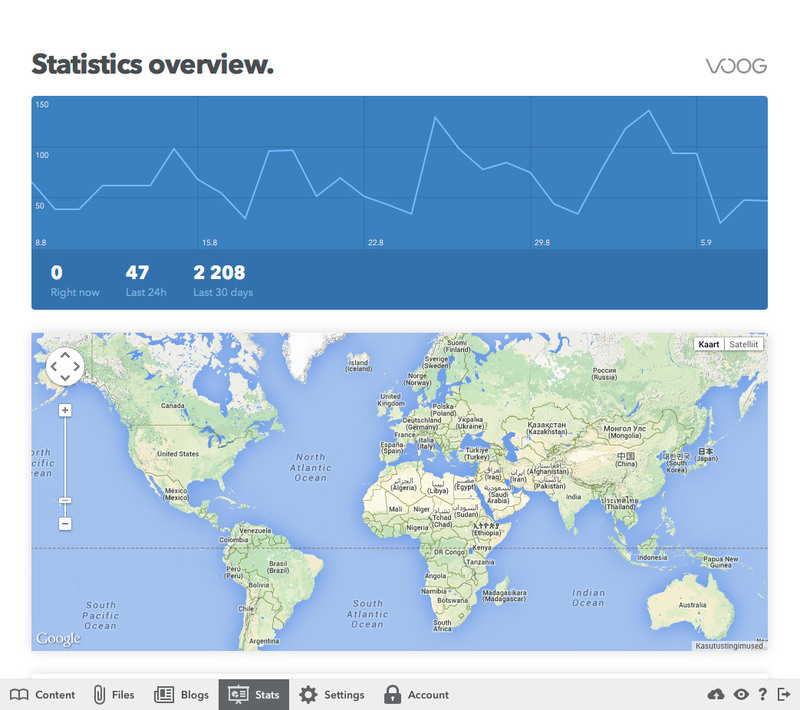 Also, the user interface of Voog itself is available in more than 10 languages. Every website needs a domain name, a memorable web address for the visitors to remember. You can either buy any kind of domain name from us or easily import (point) your existing one to your new website at Voog. Get to know your visitors, track how they are using your website, what's the popularity of each blog post or which other website sends most visitors to your doorstep. In addition to our easy to use built-in stats engine you can connect Google Analytics, Kissmetrics or any other professional-grade website analytics tool to your site. Web professionals can make use of our developer tools and build any kind of websites for their customers on Voog. There are powerful developer tools for a number of uses — complete API to integrate your site with any other system from backend, the git-like Kit which lets you publish design updates from your usual development environment and the database engine to let you build product catalogues.